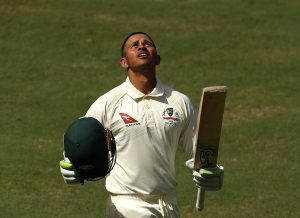 Opener Usman Khawaja hit a battling hundred to thwart Pakistan and help Australia escape with a draw in the primary Test in Dubai. The left-hander hit a strong 141 to bring up his 7th test century, while the Australian captain Tim Paine remained unbeaten on 61, and Travis Head likewise hit a half century, as Australia completed at 362-8 late in the day with lights going ahead at Dubai stadium. After Khawaja was expelled with 14.3 overs left and Yasir Shah immediately took the wickets of Mitchell Starc and Peter Siddle, however, Tim Paine and Nathan Lyon proved to be a wall against Pakistani bowling attack and survived the last 12.1 overs. Congratulations Australia on a wonderful fight. Well played Pakistan. What a final day in Dubai!